I just got off the phone with Ann from the ISRA. We talked about the Active Shooter course they are offering in April. I let her know that others had concerns over this course and possibly the instructor and that she would be receiving emails in regards to this. I directed Ann to this website and had her read for herself the comments and concerns that were posted. I directed her to post #30 by NRA Pistol where this topic started. By the tone of her voice, I think she was surprised at what she read. At this point I also questioned whether this course was sanctioned by FEMA / DHS and she did not know. She did not know whether it was a "Certified " course or not. Ann will be passing this information on to her boss, Richard. I took that to be Richard Pearson. I gave her my cell number and asked her to call me when she had any information regarding our questions. I should be hearing from her by either Friday or early next week. When I have any answers, I will post them here. Thank you very much. This is great! I hope that the class is not full by the time they get back to you, so that if it is a certified course, and our concerns are addressed, that it is not full and we can still get in. I hope it is a certified course as I am signed up. I hate to say this, but if it is not sanctioned / certified, I will probably drop the course. Only time will tell. That's what I'm hinging my decision on. I sent my own email with my questions yesterday and got a reply back this morning that doesn't really set well with me. Are there any training prerequisites for the course? Is there a course syllabus that I can preview? What are the material requirements for the course? All you need to have is a valid FOID card and pen & paper if you want to take notes. There are no prerequisites, except you need to pre-register, we accept NO walk-ins. There is no syllabus, our instructor will be going over various scenarios, what to ‘watch’ for and what we should or should not do if we come across an active shooter. The course fee provides donut/Danish , coffee or tea in the morning and lunch in the afternoon as well as a drink (water or pop). So I don't really have an understanding of what we're going to be learning, the material we're covering, or why we need a FOID. The only thing I am certain of is someone will be talking to me and that I'm going to get a breakfast I cannot eat and some sort of lunch. Great way to sell a class. I kind of had the same feeling as you do. Again, if the course is not sanctioned / certified then what good is it really? We may get some good information but that's no guarantee. who are you wanting it to be certified by exactly? From the other thread, FEMA/DHS certifies active shooter course participants. 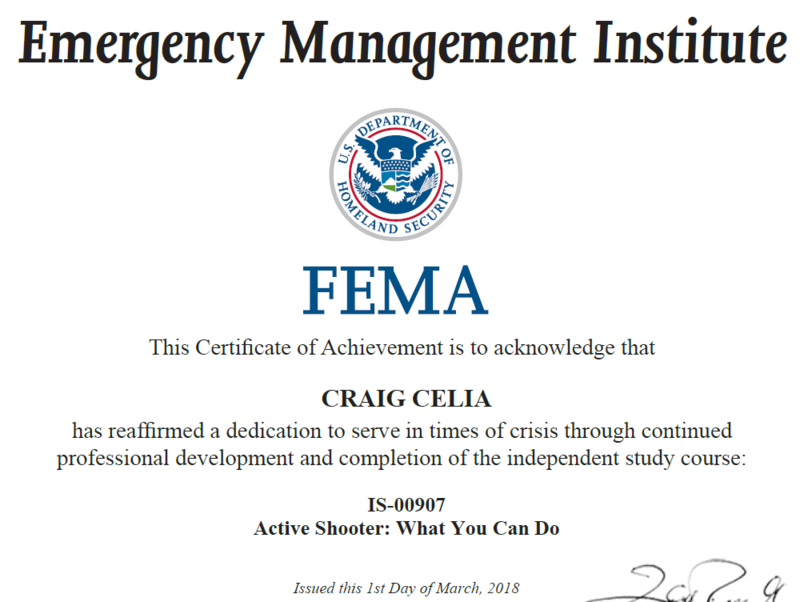 So our question there would be, is this a FEMA/DHS sanctioned course and will we be provided the that certification that we attended/completed the course to their satisfaction? If the answer is yes, then that is a big reason to take this course. That certification holds water. I signed up for the course, also. I went to the Department of Homeland Security and found some additional info. There is a video, as well as discussion material. Didn't say whether it was certified or not. No sense on taking if not certified. MY 1911 BEATS A 911 CALL! Would you mind posting the links to that stuff? Course Overview: An active shooter is an individual actively engaged in killing or attempting to kill people in a confined and other populated area. In most cases, active shooters use firearms and there is no pattern or method to their selection of victims. Active shooter situations are unpredictable and evolve quickly. Can someone direct to the original post about the concerns (post #30)? It's in the Right to Carry forum under the Student Safety and Protection Resolution topic. I spoke to DHS a week or two ago, and they stated they do not certify instructors and stated they had no upcoming courses in the area. He was a very nice guy, former cop in morton grove, we got to chit chatting about various topics and guns. LOL He seemed bored. If they do not certify instructors and there are no upcoming courses, then how is this guy teaching this class. Makes me wonder. Maybe you need to call Ann at the ISRA and let her know about this. From FEMA Q&A: Who can teach independent study courses? I'm not going to get in on this class. Sounds like the class is not what it's advertised to be and with $100 I can put toward other training and just get what I need to know from the links provided. I would be concerned with a class size of up to 60 people in a single 8 hour day. I took a two-day class out at the Sig Sauer Academy, in New Hampshire a few years ago. It was a combination of class room and live fire; we had around a dozen students and I feel that is a more appropriate class size. There is also a 3rd day class available with Force-on-Force scenario training, using simunitions. Also highly recommended! Of course you’re going to have to travel to New Hampshire and it’s going to cost you more than $50 (ISRA Member), but I think you will receive the type of training that you are looking for. I just took this online. It's kind of a joke, really. 15 minutes long and free. I`m impressed. There are 14 minutes of video alone. If you could read all that text, answer the questions, and take the test in less than a minute, impressive. Edited by NRApistol, 01 March 2018 - 01:34 PM. That's if you actually paid attention to the video. Yes sir. 12 questions long for the test. Edited by Craigcelia, 01 March 2018 - 02:16 PM. Good job, sorry you thought the course was a joke. Take the time to go through the material available for download. Edited by NRApistol, 01 March 2018 - 03:04 PM. Maybe I will, it's probably not a fair statement to say it was a joke. I've been through similar training like this in my career. I think this might be useful for people who have no idea what to do or school employees. Lots of good free info including PDF and Powerpoint presentations. Edited by NRApistol, 02 March 2018 - 07:34 PM. So has the ISRA Homeland Security Active Shooter Course instructor been confirmed as the same person featured in the Stars and Stripes article? OK, I just got off the phone with Ann from the ISRA. She did speak with Richard Pearson and I was told that this course is Homeland Security approved. My next question was as to whether we would receive a certificate of course completion. Ann did not have an answer for that but I think she will be checking on it. From my understanding, yes, this is the same Jeff Gregorec from the 2007 article. Ann's only comment about Jeff is that he was acquitted from those charges and is still currently working for the military. She will be in contact with him soon as they have other questions and I hope she contacts me back soon with my question about the class certificate.